Life has a way of dishing out those inevitable spots and spills. Will you be ready for them? When compared to carpeting, upholstery fabrics are subjected to a higher concentration of particular types of soiling - food and beverage spills, body oils, pet hair, atmospheric cooking oils, lotions, and more. By its very nature, upholstered fabric is thinner and more susceptible to texture damage from particulate and oil based soils. Periodic professional cleaning will extend the useful life of the fabric, and provide your family with a healthier home to truly live in. 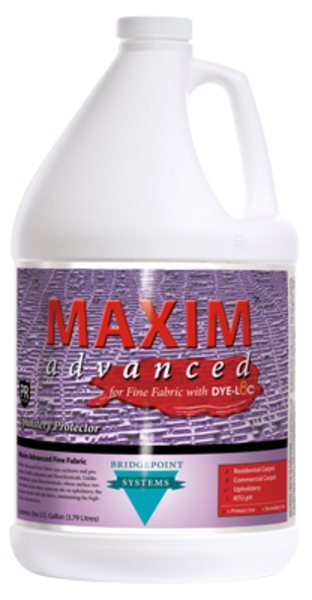 Protecting your upholstered fabric with Maxim Advanced for Upholstery will make spills easier to clean up, prevents soil from becoming deeply embedded into the fabric (making vacuuming more effective), and protects against a build-up of oil based soiling. Not only does a fabric protection treatment create a barrier against stains and spills, it has been shown to provide a barrier against the soil and dust particles that cause excess abrasion and can cause premature fabric wear. What makes Maxim Advanced for Upholstery better? Due to the fact that some delicate, natural upholstery fabrics are water sensitive, most upholstery based fabric protectors are solvent based. While this may have been safer for the fiber, it may not have necessarily been the best thing for you and your home. Smelly solvents permeate the air and release volatile organic compounds into the breathing zone until they dry. Maxim Advanced is different because it is water based, rather than solvent based, making it safer for your home, children, and pets. And because Maxim Advanced also contains special dye locking and color stabilization additives, it is safe to use on even the most delicate, natural upholstery fabrics. It also contains a special additive that helps it spread consistently and evenly across the entire fabric. It protects against soil and spills that are typical to upholstery, such as body oils, airborne oils, and beverage spills. A special drying additive allows the moisture to evaporate away quickly for rapid drying. As you have read, not all protectors are created equal. Most are designed for carpeting, not upholstery. The ones that are made specifically for upholstery contain smelly solvents. You do not have to constantly worry and fret when people sit on your upholstered furniture and eat or drink. If they accidentally spill something, spot and spill clean-up is easy and painless. Your upholstery will last longer because it will not "ugly-out" from soiling and stains, and it makes subsequent vacuuming faster, easier, and more efficient. We choose to apply Maxim because it is specifically formulated for upholstery fabrics and to protect against the soils that are most common to them. Not only that, but we take extra steps to assure you receive the highest quality application available. We follow manufacturer-recommended application rates to the exact letter. 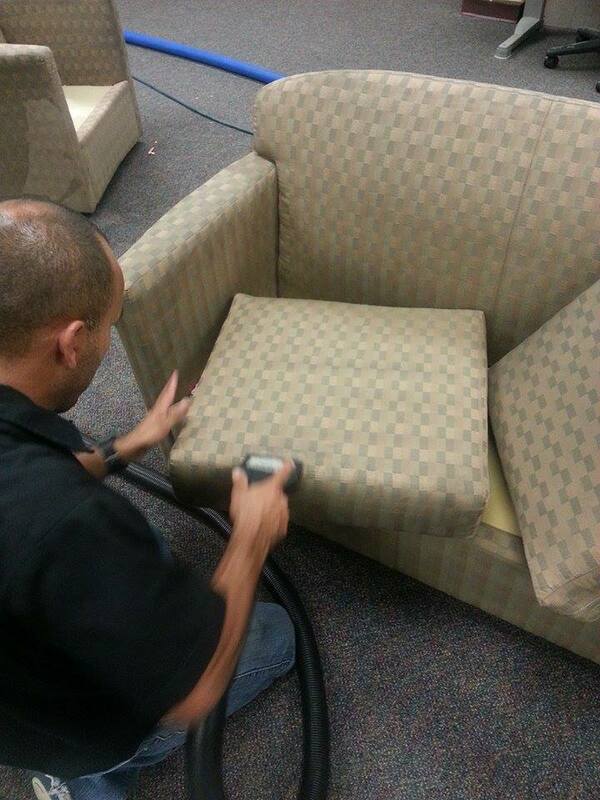 We groom the upholstery with a professional grooming tool to ensure proper product distribution and to leave your upholstery looking great. 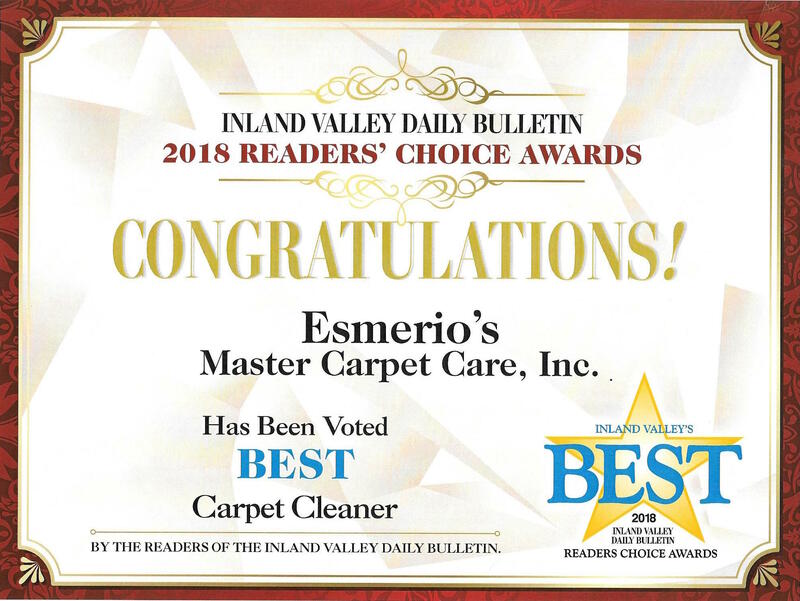 If you're in the Highland area, and are interested in having your upholstery cleaned and/or protected, give us a call at 1 (800) 848-8385!